At the end of this year, and early next year, we will see the first signs of how the medium that we call mixed reality (augmented and virtual reality) will take its rightful place in entertainment with books, radio, TV, streaming, movie theaters and gaming. The popularity of escape rooms, immersive theaters (like Sleep no more) and immersive theme park attractions, such as Harry Potter or Star wars, show a trend in social entertainment. Being fully immersed in a world and getting pulled into a story with your friends is what it is all about now. This is possible in today’s world, but is still considered a kind of luxury that some can experience at a Comic Con (Blade Runner or Westworld) experience. Within the next 12 months we will start to experience the first wave of immersive social experiences. They will mainly use virtual reality with custom hardware to enable players to walk in worlds and interact with each other. It will start like the movie theaters did, with most of us experiencing high end VR experiences at specific locations. Those locations are set to open up all over the US within the next 12 months. In Los Angeles, we already have Dreamscape, Two Bit Circus , Spaces, iMax VR and half a dozen other VR escape rooms available. For a few dollars we can enjoy high end content with the most advanced hardware, enabling multisensorial experiences with our friends. The quality of the experiences, and the level of immersion, will generate emotions that users have never experienced with any other medium. Rides at theme parks were, until now, the closest comparison. We are very excited by this new type of entertainment and really looking forward to it. As we always do when our dreams come true, we begin imagining the next ones. One of the current limitations in the virtual reality experience is that we lose a lot of the body language communication. That’s fine in action games, but when you want to guess if someone is lying or bluffing, you need the body language. We believe that an entire genre of experiences can greatly benefit from an augmented reality experience. A few months ago we demonstrated that augmented reality can be used for location based entertainment that can get people excited. It was the VRLA mixed reality Easter egg hunt. That experience was a success, even with its simplicity. 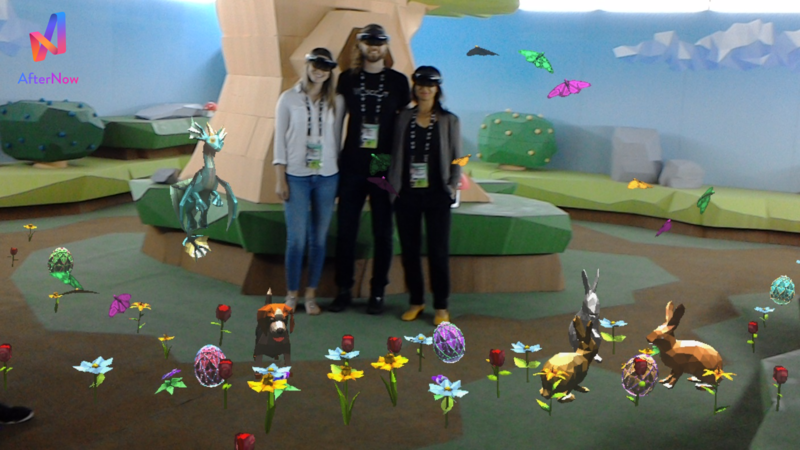 We used the Hololens from Microsoft, and we learned a lot about the process and the type of experiences that could work with the current limitations of the headset. The first thing we learned is that you need a physical set that you can augment. When it comes to experiences that require communication between players, whether it be part of the story line or playing a role or solving a problem, murder mysteries, space crew simulations, strategy games involving negotiations including escape room styles of scenarios, these would all work great in an augmented reality experience. Lying, secrets, double personalities, time based hints; all this can be induced or stimulated with external virtual elements generated by augmented reality headsets. I am personally very excited. I’ve always dreamed of immersive experiences where we could live the experience, more than just being spectators or seeing it in third person. Ever since I saw Westworld as a kid, I’ve always wanted to create worlds that could take participants into a story that felt like it was reality. Today, we are getting one step closer to making stories more real. We are currently working on a couple of new experiences. Anyone interested in learning more or participating on this journey- please feel free to reach out.